LISTEN: Teen wounded in attack near Hevron directed emergency team to the scene; Red Crescent ambulance ignored them. The family members of an Israeli father and son shot dead in front of them as they drove in Hevron were able to direct emergency services to the site of the attack while still under fire. 40-year-old Rabbi Ya'akov Litman and his 18-year-old son Netanel were murdered in the attack, which also left Ya'akov's wife and several of his children injured. A car with a Palestinian Authority license plate overtook the family, who were traveling to a pre-wedding celebration, and opened fire. After the victims' car ground to a halt one terrorist exited his vehicle and fired several more bullets into the prone car, before all the attackers quickly escaped. IDF forces are currently conducting an extensive search for the culprits. Incredibly, the 16-year-old victim wounded in the attack managed to call emergency services as the attack took place, and informed them of the precise location even while shots were still being fired. Responders say he was lucid throughout. "We are about a kilometer after Otniel - they shot at our car," he said. When the operator asked him "in what direction?" he responded: "Heading south. There is a (Palestinian) Red Crescent ambulance here, we have two casualties. There are seven of us in the car." The operator then asked him to clarify the condition of the wounded. "One is wounded in the head," he answered, at which point his attention was distracted and he broke off - apparently due to the fact that the Palestinian ambulance he had spotted sped away instead of attempting to aid the wounded. "There is a Red Crescent ambulance here, but he's driving away from us - I don't know why," the teen said. "I want you to give me details," the operator responded. "We are dispatching forces and in the meantime I want to know if they will be enough." The teenager then informed the hotline that another ambulance was approaching, as the operator continued to ask him for more details - which he managed to answer without faltering. His last words to the operator were: "The ambulance driver is coming out." The attack is believed to have been carried out as a planned ambush, with the terrorists lying in wait along Route 60 until they identified a vehicle filled with Israeli civilians. The attackers then overtook the victims' car in the next lane and carried out the attack. 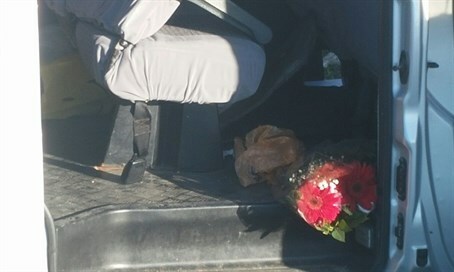 The father and driver of the car - identified as Ya'akov Litman - veered into the hard shoulder after being fatally wounded in the initial burst of gunfire. His 18-year-old son Netanel also managed to call emergency services and alert them to the attack, before being himself fatally shot. Netanel's 16-year-old brother, who suffered a gunshot wound to his leg, then called emergency services as well and began directing them to the scene, as related above, at which point the terrorists fled northward. The Litmans' car was punctured by bullet holes on both sides, as one of the terrorists had attempted to ensure all its occupants were dead. The mother and three young daughters were also lightly wounded. All the injured victims were evacuated to Soroka hospital in Be'er Sheva. A massive manhunt is underway, including unmanned drones, much of which is centering on the Arab village of Yatta. Following the attack, a joint crisis center was set up by Defense Minister Moshe Ya'alon, IDF Chief of Staff Gadi Eizenkot, Shin Bet (Israel Security Agency) head Yoram Cohen, Army Intelligence chief General Hertzi Halevi and other senior IDF officers.